Amy's Creative Pursuits: The Eau Claire River Walk and We Have A New Ice Cream Store In Town! 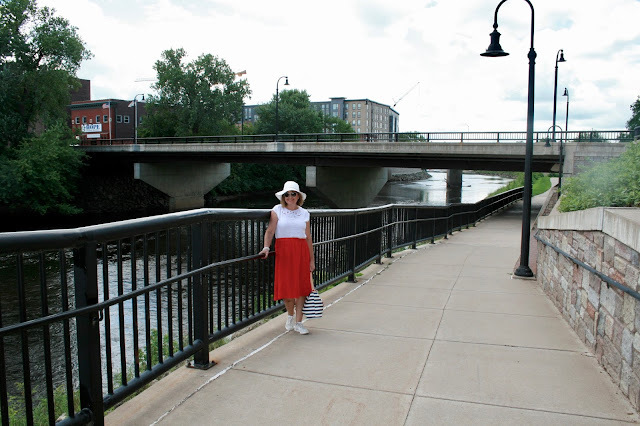 The Eau Claire River Walk and We Have A New Ice Cream Store In Town! About two years ago my husband and I left our small hometown church and started attending a big church in the nearest city about 45 minutes away. It was a difficult decision but ultimately it came down to the fact that I had never, ever been happy at this small town church and I was trying to make it work for convenience sake. After years of a lot of pain and trials, I just realized that this church was just not good for me. I got caught up in the fact that we shouldn't think of a church for "what it can do for me" rather "how can I serve". And although there is a lot of truth in that statement, a church is not just suppose to be a place just where you serve, but also where you come together with a body of like-minded believers who edify and lift each other up. The problem was, I wasn't being lifted up. I felt torn and ripped apart week after week and I was constantly getting my feelings hurt. I would leave church angry and upset and it would take me an entire week to get over it, only to return back the following the Sunday and start the process all over again. Eventually, there was a "straw that broke the camels back" and I left. Or maybe it was God giving me the final shove out the door because I couldn't do it myself. Who knows? But one thing I do know...leaving that church, as painful as it was, was one of the best decisions of my life. It was such a toxic relationship. Have you ever had one of those toxic relationships...you know the kind, where you love the person, want to be committed to the relationship, yet nothing is ever "right" about it? You're constantly hurt, or your hurting them. Finally, the best thing you can do is just to separate to stop hurting each other. That was me and my relationship with that church. Toxic. For awhile, we didn't go to church anywhere. My husband did not want to drive the long distance to Eau Claire when he already drove that distance five days a week for work. We had services at home. We would watch a sermon on the Internet, sing hymns, and then pray together. It was a good break for us. A time of healing. But eventually, God put it on our hearts to check out a new church. One we had not been to before. At first, we went intermittently: once a month or so, and the other Sundays we had home services. But after a year of that I said to my husband "I know the drive is hard for you, but I really like going to this church. It's the first time in twenty five years I've enjoyed a church as much as the church I grew up in. I'd like to go more often." He agreed, so now we are regular Sunday attendees! We absolutely LOVE our new church. I can't believe I'm saying that. That I actually LOVE to go to church again. I have hated, hated going to church for years. Isn't that awful? I would literally start getting in a bad mood the night before just thinking about going to church the next day. Yet I went. Out of duty and obligation, but not out of love. So now you're probably wondering what all of this has to do with a river walk and ice cream. Well, I will tell you. Because our new church is so far away, we decided to make Sundays our Fun Days! 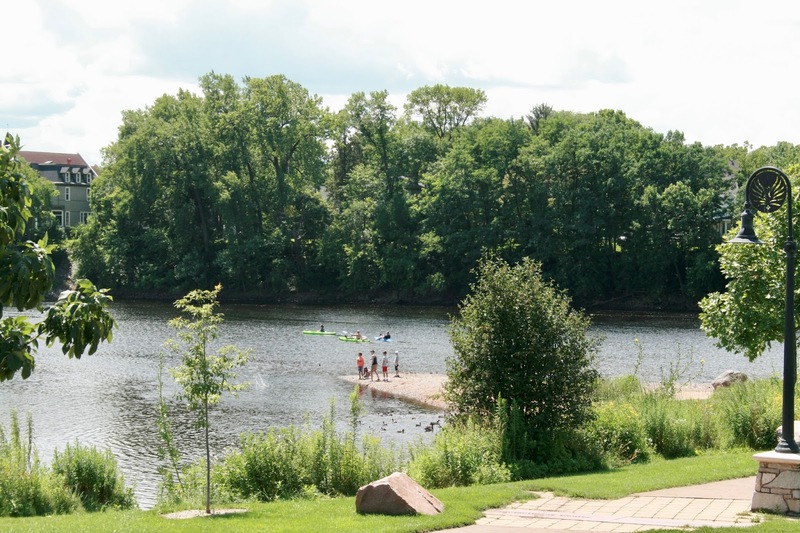 Even though Eau Claire is the nearest large city to where we live, other than work or shopping, we never spent much time there. So every weekend this summer, we have been making up for that and rediscovering our home town. 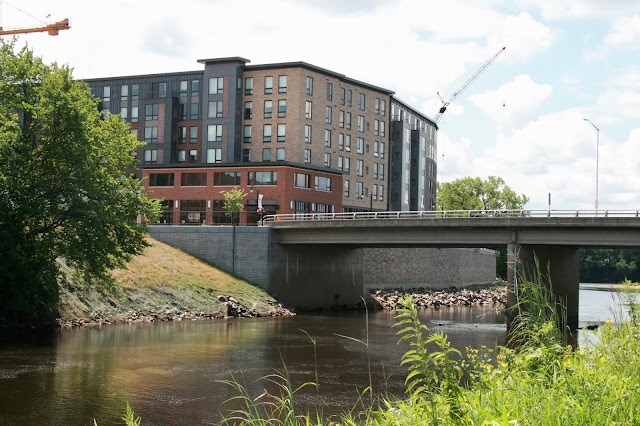 Eau Claire has spent millions of dollars the past decade revitalizing their downtown. I have to be honest and say that I haven't been paying much attention to it until now. I use to spend a lot of time downtown when my kids were still living at home. They were either studying music at the University, taking lessons, or participating in the community band or children's theatre, resulting in me driving them several days a week. But once they left the nest over ten years ago, I stopped going downtown so I had no clue what was going on down there! And boy was I surprised when I went back with my husband this one Sunday in July. At first we went to a part of the river walk that isn't new. It has been there as long as I can remember, which is at least 25 years because that's when we moved to this area. 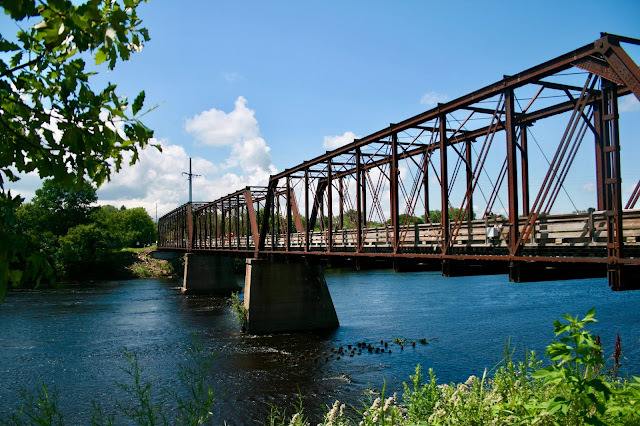 It is a lovely paved bicycle path that connects Eau Claire to the surrounding areas of Chippewa Falls and Altoona. Since we were on foot, we only took the path a short distance till we got to the old bridge that crosses over the Eau Claire river. It's a beautiful view isn't it? Hard to believe that you are actually inside city limits. This is the bridge from where the photograph above was taken. It's a gorgeous structure, isn't it? Originally built for trains, the bridge was converted to a trail in 2002. 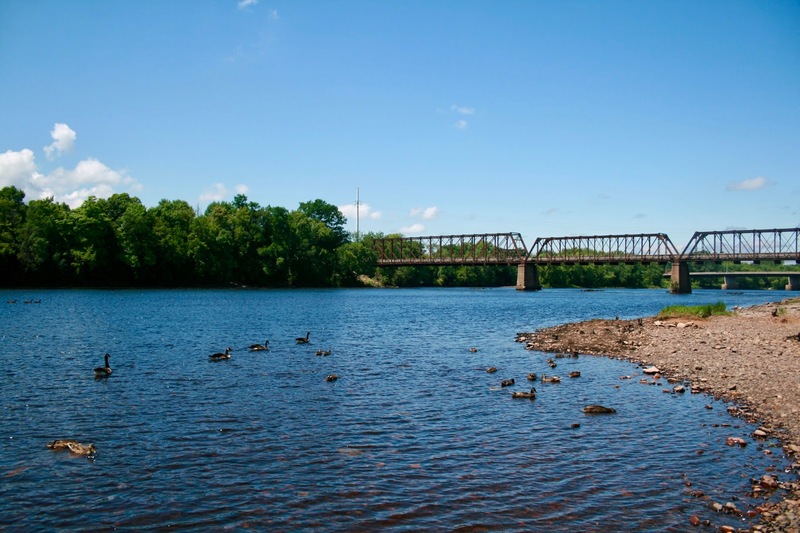 An interesting fact about this bridge is that it has an S shape so it could cross the river between tracks running parallel to the river. 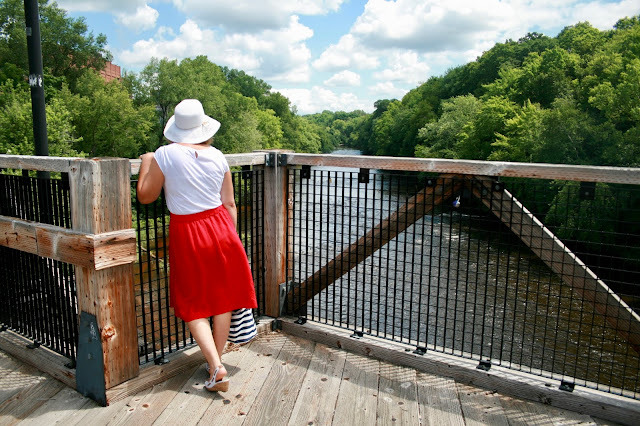 There is a viewing portion in the center of the bridge to enjoy the gorgeous views! Behind me is Banbury Place. 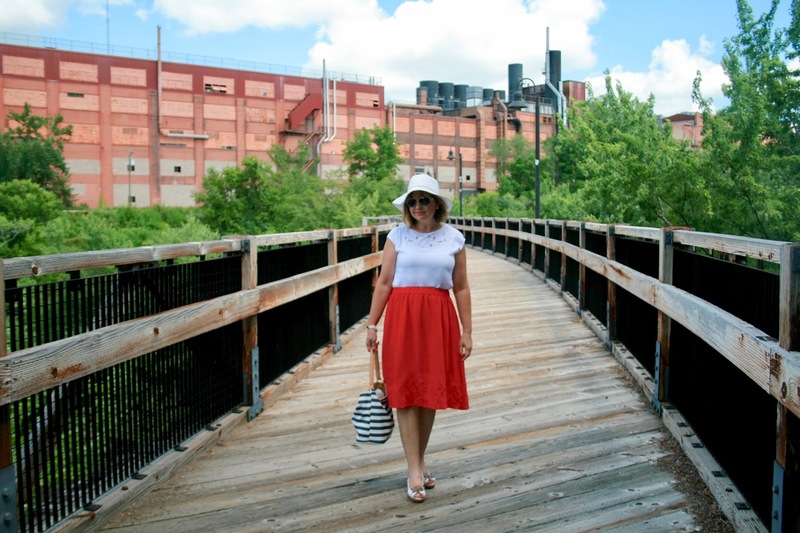 It use to be a Uniroyal Tire Factory, but when hard economic times caused the factory to close in 1992 it was renovated into commercial, service, warehousing, manufacturing, and residential space. After walking on the older portion of the path we ended up making a complete circle right back to where we parked our car. We knew there was more trail just a couple of city blocks away, so we headed in that direction and that was when we discovered Ramones! 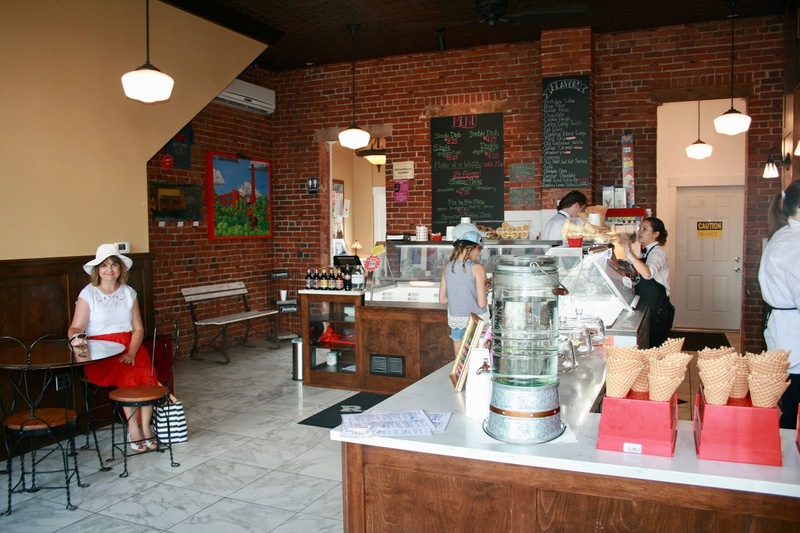 I had read about a old-fashioned ice cream parlor that recently opened in Eau Claire, but I had no idea where it was. Imagine my surprise to just happen to come across it! The second I opened the door I could smell the delicious aroma of freshly baked waffle cones! YUM! Ramones was a feast for the senses: the smells, the charming old fashioned decor, and the delicious taste of old-fashioned ice cream. 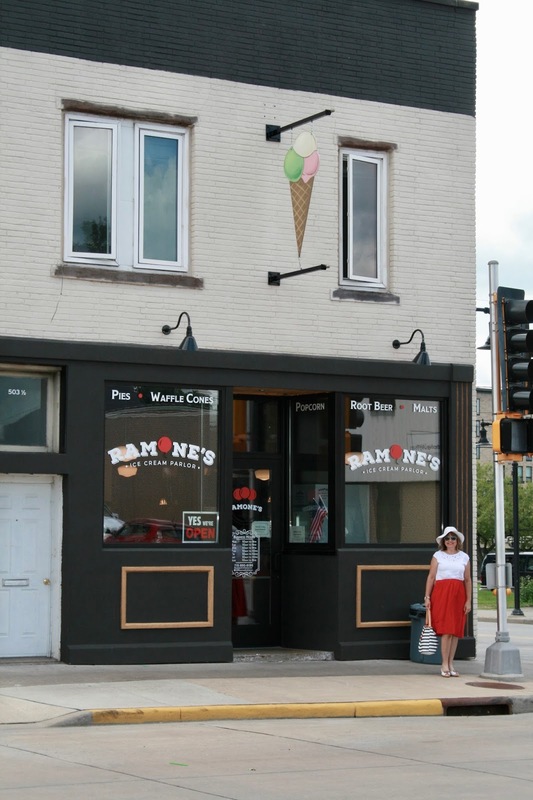 Ramones offers 24 flavors of hand-dipped cones, sundaes, or malts. Their ice cream is low in air, and low in high fructose corn syrup, food coloring, and other additives. And did I mention how charming the atmosphere was? 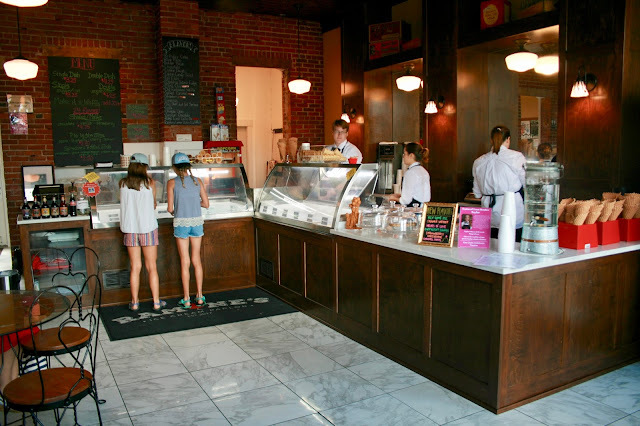 From the gorgeous wood and marble counter, to the exposed brick wall, and cute ice cream parlor seating, Ramones oozes charm! Now, I have no idea why, but I never got a waffle cone! I smelled them from the second I stepped in the door and I drooled watching the employees make them, but for some reason I ordered a Butter Pecan Malt. But, it was worth it, it was DELICIOUS! 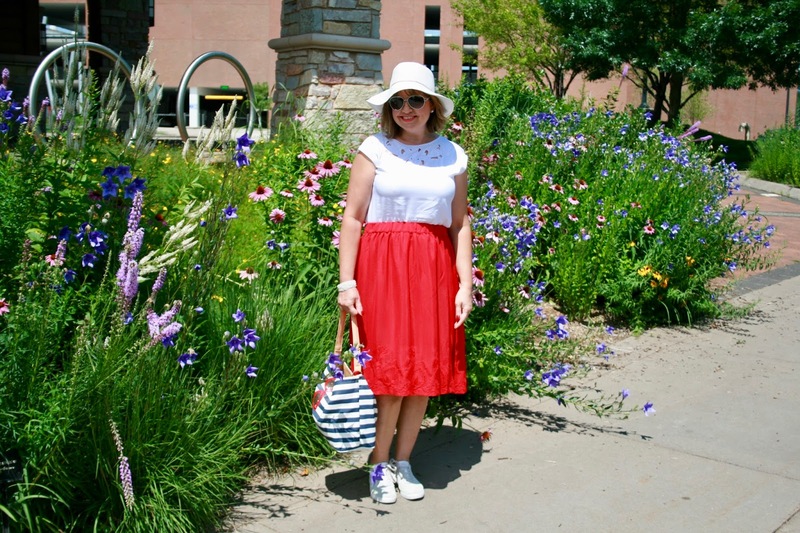 I said to my husband, next time we go back (and we will!) I will get a waffle cone! After our ice cream break, we headed back to the river walk. Now this first part, I had seen before. I could vaguely remember walking here with my kids and some friends. It is new development, but not recent. It was beyond this spot, that I was blown away! This building here, which is still being worked on as evidenced by the cranes, used to be a dump. My daughter use to rehearse in the lower space for the Eau Claire Children's Theatre. 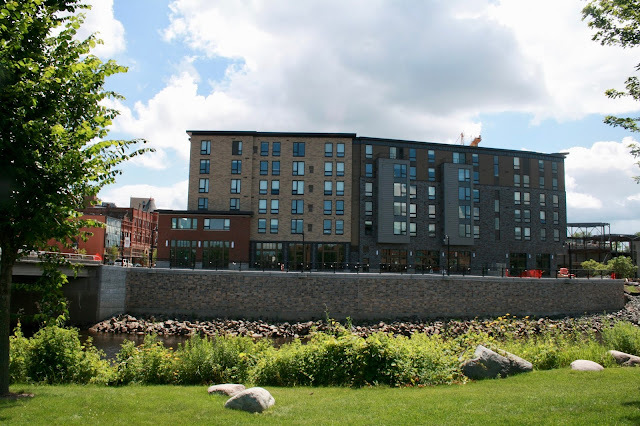 Now it's been totally renovated and is called the Haymarket Landing Building which provides fully furnished apartments for college students (gees, I wish I had an alternative living space like this when I was in college) and also commercial space. I can not believe this is the same building I use to take my daughter too. I'm simply amazed! And the best part is, they are not done yet. It's actually part of The Confluence Project which will include a new community arts center with three performance spaces, galleries, offices, studios and more. And from there, it just got better and better for everything was new to us. 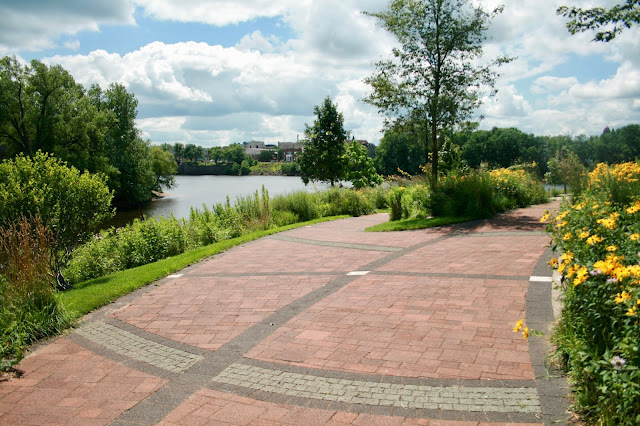 We were absolutely blown away by the beautiful new brick walking paths along the scenic Eau Claire River and all the gorgeous perennial wild flower gardens. Off the path was a large sand bar where people were sunning themselves. 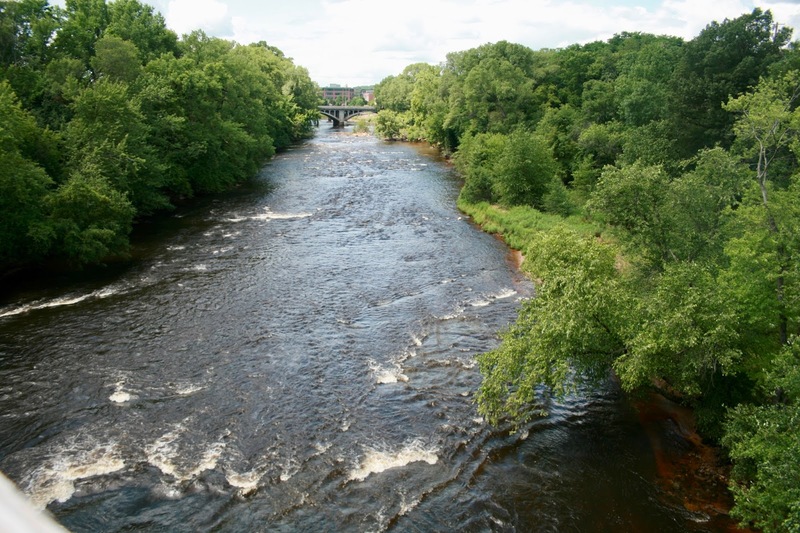 It's a good spot to drop a kayak or tube in and take a ride downstream. 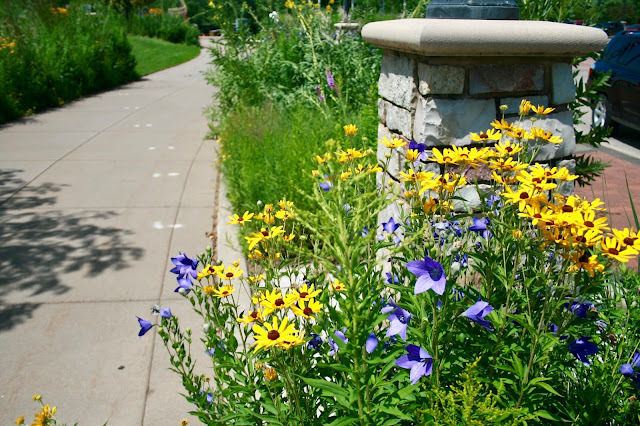 There were flower beds and planters everywhere, and they were all in full bloom and looking beautiful! 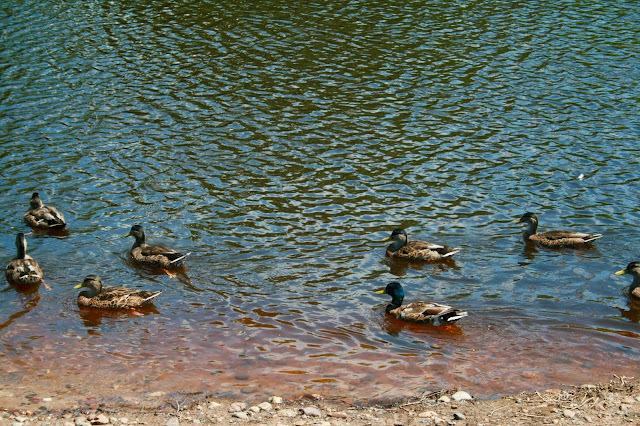 Of course we saw plenty of ducks enjoying this beautiful day as well. Eau Claire has many old, historic bridges. 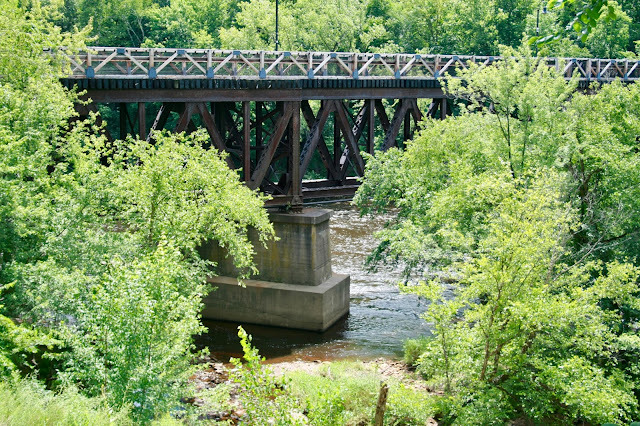 This one is The Phoenix Park Bridge built in 1903. It was also converted to a trail after it was abandoned in 1981. We enjoyed walking this trail so much. The weather was perfect. Everyone seemed so happy. We saw so many hipsters that we laughed and I said to my husband "When did all these hipsters move to Eau Claire?" 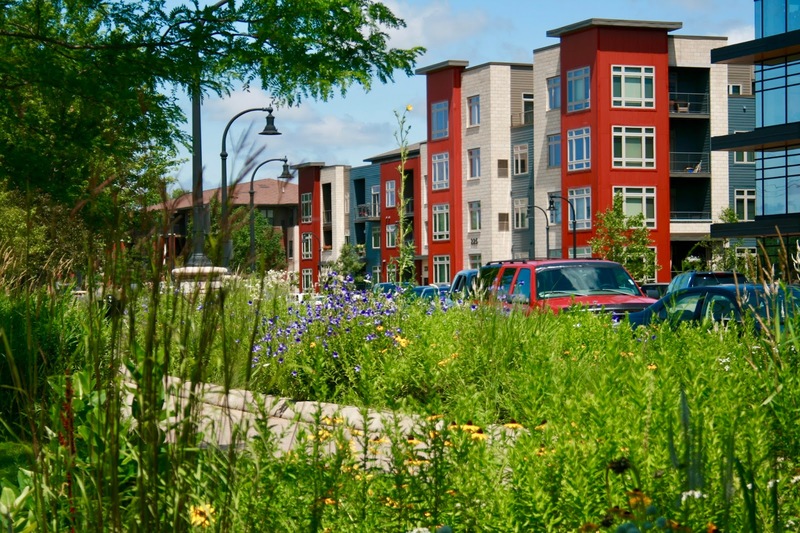 It seems the renovation brought a new subculture to our red-neck town, and I LOVE it! So often when we travel I would see communities similar to what I experienced on this river walk and I wished I lived there...now I actually do! This is also a new development right across from the river walk. We didn't spend much time exploring it (we'll save that for another day). It is a mix of apartments, shops, restaurants, and office space. My husband was having a blast taking pictures all day. He was actually annoying me at times telling me to stop and pose. At one point during our walk we became separated and a woman said to me "Where did your photographer go?" I had to laugh, because I didn't even recognize her yet she must have noticed my crazy husband taking a lot of pictures of me. Oh well, it is nice to have a husband who wants and enjoys taking my picture. I know too many bloggers who have to beg their husbands to take their picture and/or use a tripod and timer. Did I mention how much I LOVED the flowers! Oh, they were a feast for the eyes. 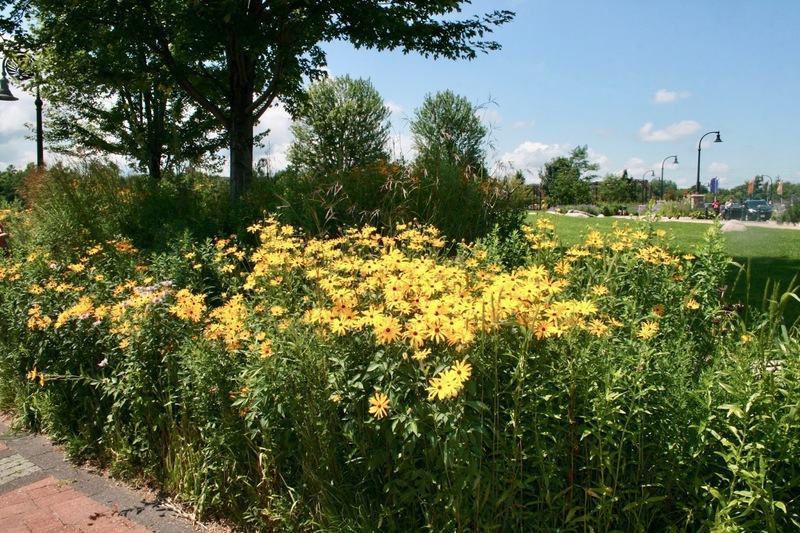 And I what I loved most about them was that they were natural flower gardens. 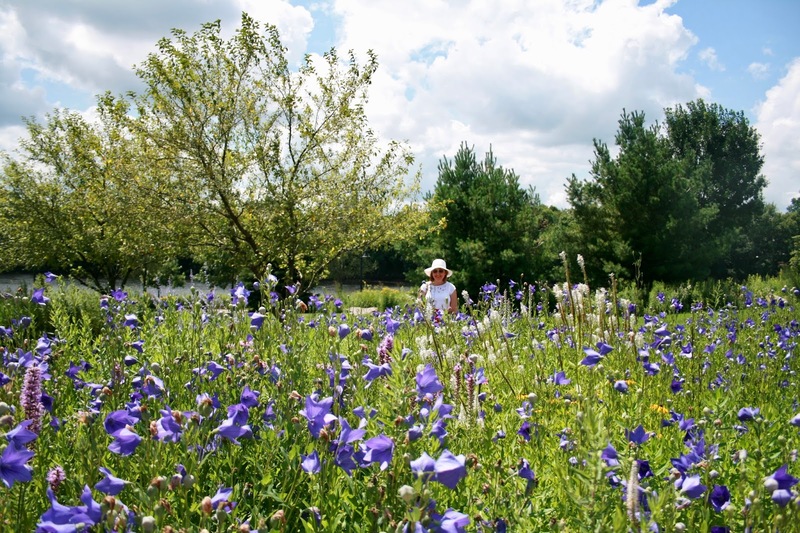 I loved this field of balloon flowers. I had balloon flowers in my own garden a long time ago, but it never grew like this. What is their secret? Seeing this makes me want to try this plant again. After walking this trail, my husband and I decided it was time to purchase some bicycles so we can go further and see more. I want one of those old fashioned bikes, in pink, with a straw basket! This day was just one of many happy summer days where we had fun exploring our own hometown after church. I'm so happy we decided to go back to church regularly and make Sunday our Fun Day! Now I look forward to Sundays once again instead of dreading them...the way the Day of Rest was always meant to be! I'm so glad you found a church home that you love and got away from that toxic relationship! Looks like you and your hubby have the best Sundays. Thanks Brooke, so am I! I LOVE Sundays again! You have a wonderful joie du vivre! keep it up! Aww, thanks Julie! I can honestly say that for the first time in my life I am truly, truly happy. Ridding myself of toxic relationships and retiring from a horrible job were two big factors! It's never too late to make changes in your life! I am so glad you found a church you love. It makes such a difference. The ice cream looks great too! Thanks Amy. I wish we would have found this church a long time ago. It would have saved us a lot of pain. 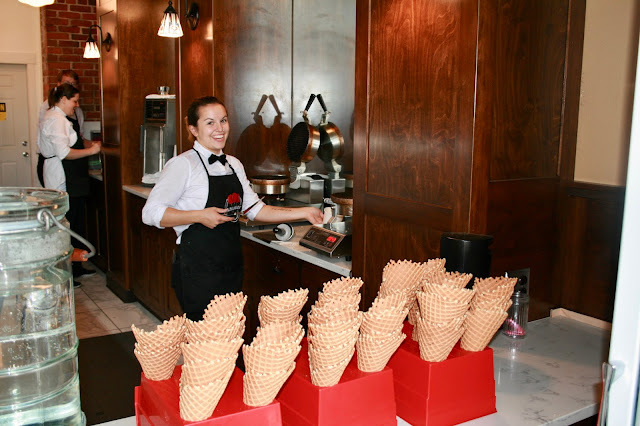 Love that cute little ice cream shoppe, and the smile on the servant's face! 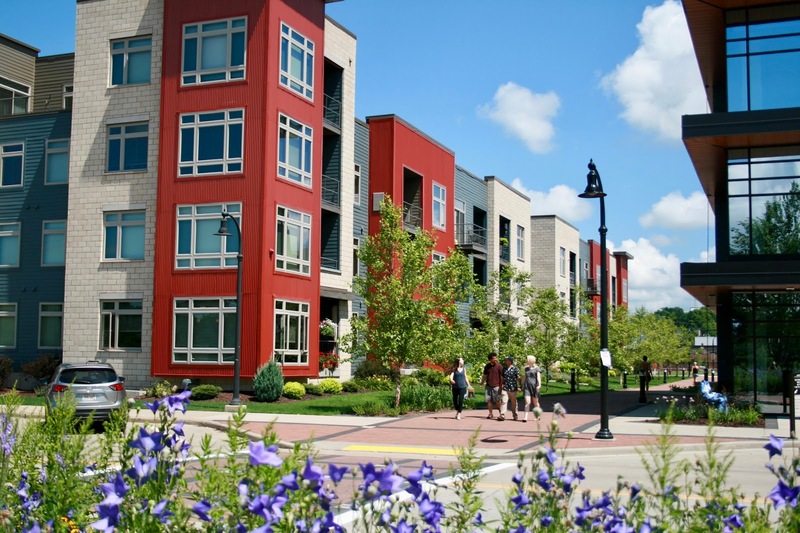 Really nice buildings too, love the brick red color on those new buildings! Yes, the state of Illinois is sad...but I can't start talking about that or I'll get into politics! I hope something changes for Illinois soon as my children live there. I do love their new tollway they just finished between Wisconsin and Illinois. Visiting my kids is sooo much easier now. And yes, I love the servant's smile too! She was such a cutie! The other employees didn't want their picture taken so she was called out from the kitchen just so my husband could take her picture. What a smile! Your husband is so sweet to take so many photos for you! My husband takes my photos, too... he is nice about it, but sometimes I think he tires of it! haha!! I love that photo of the flowers, that bridge is gorgeous and that ice cream place looks so yummy. 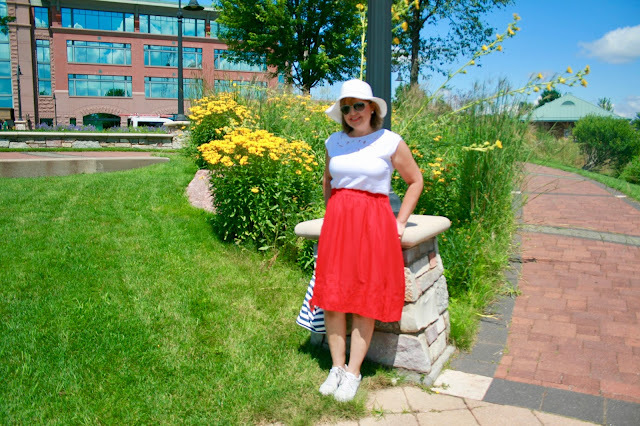 You look adorable in that bright skirt and white top/hat combo! Thanks much Carrie! I am blessed to have husband that loves to take pictures! I love sightseeing right at home! One of my favorite past times. That was an interesting read. I too have struggled with finding a church that fit when I moved to this area. Glad yours has worked out now! Thanks Nikki. We moved to this area from a large metropolitan city where there were so many great churches to choose from. It's quite different in smaller cities like Eau Claire. There aren't as many options and the churches are smaller, which then leads to other issues that you don't have to deal with in larger churches. It has always been a struggle for us to find a church that fit since moving here. But I think we finally found it! I just wish it was closer to our home! I did so enjoy reading and viewing the photos in this post, Amy, so uplifting. I could feel your continued amazement as you went on your walk and discovered a whole new town. Your state must be spending a huge amount of money on the renewals. Thank you! Yes, I'm so excited to see all the new development in my hometown. I love all the new improvements. It's finally becoming a city I actually like! They have spent millions of dollars with all these new renovations. I have no idea how they are doing it or where they are getting the money from. Great to take a virtual walk with you, Amy, while looking at your great photos. That ice cream parlour looks amazing! Thank you for joining us at the Travel Tuesday meme, I look forward to your next contribution. Thanks Nick! Yes, we loved the ice cream parlor. I can't wait to go back! I agree with the church issue. My SIL does not like her church, feels fed at all but "has to go". They live in a small town and it is a Missouri Synod Lutheran so not very grace filled. We attend a church of over a thousand and love it. It is not perfect nor are we. 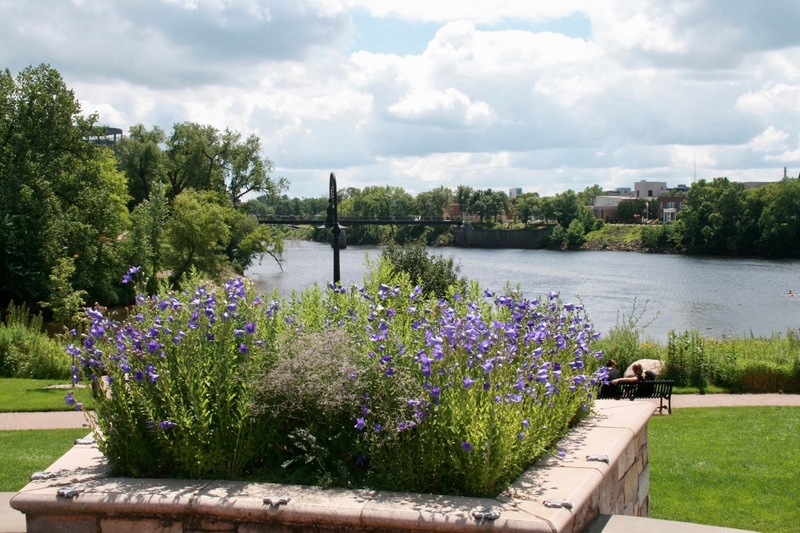 Our niece graduated from Eau Claire in May and your post makes me want to drive there this fall and visit. Our good friends also graduated from there and talk about the bars ;) We love to bike, did a 20 mile ride last Saturday, so it will be a great investment! Thanks Christa, it is so hard to find a good church when you live in a small town. There are so many small town "issues" in small town churches that you just don't have in big, city churches. My husband and I know so many families that live in our small town that also drive an hour to Eau Claire to attend church. We've often said "If all these people would gather together in our small town, we'd have a large church!" LOL! However, I don't know if you can ever stop small town politics from playing a role in small town churches. It's ingrained in their culture for generations. And yes, you must come to Eau Claire in the fall...we have the most beautiful fall foliage and If you love to bike, bring your bike because we have a great bike path too! Watch the fall foliage charts though, the color doesn't last long here!